Do menus with calorie counts work? 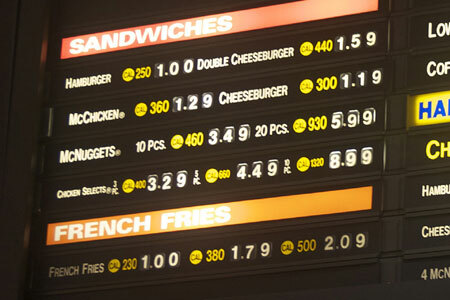 Back in 2008 when New York City ordered fast-food and other chain restaurants to post calorie information on their menus, the eateries were livid. They worried that when faced with just how many calories a Starbucks Venti Java Chip Frappaccino (440 calories) or one of Pizzeria Unos’ individual Chicago Classic Deep Dish Pizza (2310!) actually contained, they’d stop coming in search of healthier options. Turns out the restaurant industry had nothing to worry about. A recent study by researchers at New York University looked at whether the change affected the eating habits of New York City and Newark, NJ kids from low-income families. (New Jersey served as the control group because the state doesn’t yet require calorie information to be posted). They discovered that although 60 percent of the kids who ordered their own food noticed the information, 90 percent of them said the labels didn’t affect what they ordered. It was the same when it came to kids whose parents ordered for them. So are calorie counts a waste? Not necessarily, say the researchers. What they concluded from this study is that in addition to providing the labels, people need to be educated about what makes up a healthy diet. In essence, what good is knowing how many calories something contains if you don’t know how many calories you should be eating in the first place? But the question then becomes is it the responsibility of the individual or the government to get this information? I should point out this NYU study comes federal officials write rules requiring chain restaurants across the country to post calorie information on their menus and drive-through signs. This entry was posted on February 18, 2011 at 7:16 am and is filed under Health Crisises, Obesity. You can follow any responses to this entry through the RSS 2.0 feed. You can leave a response, or trackback from your own site.